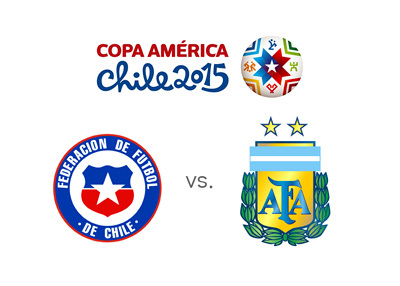 By far the two best teams of the Copa America 2015, Chile and Argentina, are meeting in the tournament final on Saturday, July 4th in Santiago. Chile beat Peru 2-1 in the semis thanks in part to the home crowd support, couple of refereeing decisions and a magnificent strike by Eduardo Vargas. Argentina on the other hand finally woke up from their slumber and trashed Paraguay 6-1 after four sub-par performances earlier in the tournament. After witnessing the resurgence of Lionel Messi in the national team colours, who provided 3 assists and was involved in all 6 goals vs. Paraguay, the odds have shifted heavily in favour of Argentina to go all the way and win the Copa America 2015 in front of a hostile Chilean crowd. This is the final that everyone was hoping for and it promises to be a treat. Alexis Sanchez has had a fairly quiet tournament so far for Chile and this would be a perfect opportunity for a breakthrough performance. His team surely will need him if they are to lift the Copa America trophy for the first time. Argentina are also poised to win on Saturday and end their 22-year trophy drought. The last time Celeste won a major tournament was in 1993 (Copa America).